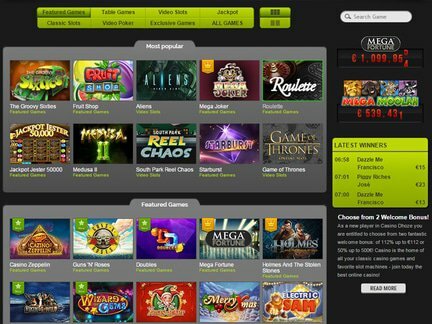 Dhoze Casino is a user-friedly site with a large collection of online casino games. The casino creators boast about the state-of-the-art functionality of the website as well as the quality products that are delievered by the venue. A number of player protection tools are featured in order to prevent unhealthy gaming behavior. Big casino jackpots are to be expected as well. The fact that all this can be enjoyed from the comfort of one's own home is encourging. Of course, the promises of the staff will need to be tested in order to find out whether the average user can experience all the good things that have been mentioned in ads. The special offers section looks incredible. Multiple Dhoze Casino Bonus deals are featured on the page. Two welcome bonus packages are currently available to first-time players. The visitors can choose 112% up to €112 or 50% up to €500. The activation of the bonus takes place in the „my account" section. The player simply has to click on the bonus tab. A weekend cashback deal is also provided by the casino. It is easy to receive 20% cashback up to €50 very weekend. The new game Thursday deal is likewise noteworthy. All that is required is a €20 deposit. Once that amount is wagered, €10 are added and the player can explore totally new game titles. Furthermore, a big poker sign-up bonus offer is currently provided at the venue. Basically, it is a 200% sign-up bonus up to €1000. Mobile Monday bonuses deserve to be mentioned too! The nice thing is that dropping a deposit is incredibly easy with a large numbers options that are available here. They would include; Multibanco. Visa, Skrill, MasterCard, PaySafeCard, Maestro, Neteller, EntroPay, Eco Payz, etc. Dhoze Casino provides its services to players from around the world. The residents of the following countries won't be allowed to play games for real money; Belgium, China, Denmark, France, Hungary, Hong Kong, Ireland, Georgia, Italy, Malaysia, Spain, Turkey, United Kingdom and United States of America. Since the casino is licensed in Malta, it draws players from across Europe. It is also possible to spot visitors from other continents. Ten games have been featured in the „most popular" game category. Right now, the list of the highly popular games would include; The Groovy Sixties, Fruit Shop, Aliens, Mega Joker, Roulette, Jackpot Jester 50000, Medusa II, South Park Reel Chaos, Starburst and Game of Thrones. The Video Slots are getting a very high amount of traffic. Here are the other available game categories; Jackpots, Classic Slots, Video Poker and Exclusive Games. The list of winners is always published by the staff. It is good to see that there are a whole lot of winners on the site! Some disputes have been occuring with the casino. However, the venue has resolved the complaints. The venue can boast about having very good ratings among players. Its customer support service is provided by e-mail and live chat. The latter option is particularly helpful for players who would like to get in touch with the staff. The immediate contact is always appreciated. However, the phone support isn't mentioned. BML Group Limited is the operator of the casino. It is a Maltese company. The Malta Gaming Authority has issued a license for the casino. This license solves the issue of legal authority for the casino. However, the license cannot really protect customers, since the licensing body has frequently ignored requests for closer scrutiny of the casinos under its umbrella. At the same time, the casino has the right to offer casino games based on the association, even if the authority isn't ideal. I am most impressed by the special offers at the casino. The sheer amount of promotions makes me want to visit the casino on a regular basis. The game selection may not be the biggest that I've seen. It's still a decent collection though, so I cannot really offer any criticism. I can recommend the casino, especially the Video Slots. The site has a whole lot of quality games in that particular category. When it comes to negative fetaures, I would have to mention the unimpressive license from Malta.